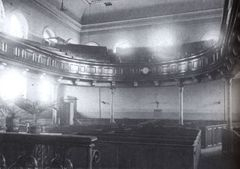 Zion Congregational Chapel on George St.
Horner is an occupational surname coming from the word horn itself and means one who makes or blows horns. It can also mean one who makes spoons, combs etc from cow horns. After the dissolution of the monasteries, these four families were granted Abbey lands. Legend has it that a John Horner was steward to the last Abbot of Glastonbury. The monks sent him to London with the title deeds of their estates concealed in a pie. Hunger overtook him and he started to eat the pie, discovering the deeds inside. He managed to get them vested in himself and so the plum of the nursery rhyme is his acquistion of these estates. Some accounts have Thomas, not John,as the Horner concerned. 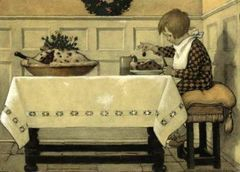 So is Little Jack Horner an ancestor of ours? It would be nice to think so. Our Horners were indeed from the Wakefield area in Yorkshire, with our main branch of the Horners eventually moving to Lancashire. There is a booklet entitled “The Horner Family of Wakefield”, published in 1879, which I have had the good fortune to read and it has extended this section of the family tree considerably. Thanks to Mark, Patrick and Diana Clements for sending me that. 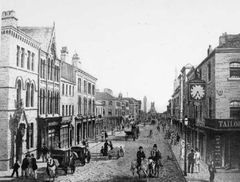 The picture above is of Northgate, Wakefield in 1853. 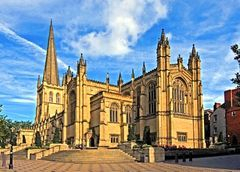 One theory of how Wakefield gained its name is that it was named after the Anglo-Saxon settler who first made his home there–a man named Waca–and that the name derives from Waca’s feld or field. Therefore the first spelling would probably have been Wacanfeld. 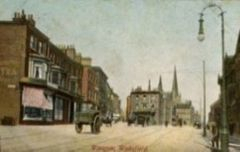 The settlement grew up around a little church and preaching cross at the top of the hill, where three lanes met–to be known as Westgate, Kirkgate and Northgate. These had gates which were shut at 8pm each night to prevent stray animals entering. 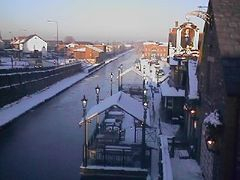 In the year 867 A.D.,York was captured by the Vikings, and the county came under Norse rule. 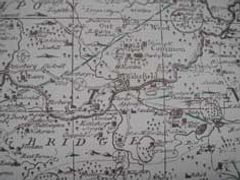 These settlers introduced the three Ridings, and their sub- division into Wapentakes.Wakefield was mainly settled by Danes, and was the centre of the wapentake of Agbrigg. This section was going to start with Joseph Horner of Ardsley,born in 1754. However, thanks to the Horner Family of Wakefield booklet, 1879, compiled from Public Records and Family Archives, we will start around 1550 instead. Quite a change of plan! It was then that Thomas Horner was born. He married Jane Foxcroft in Batley on the 15th of June and started an unbroken line of descendents to myself in 1950. The same source also names Thomas’ wife as Elizabeth Foxcroft. However, in the Records of the Transfer of Land and Property, from the Yorkshire Archaeological Society Record Series, there is a reference to ‘Thomas Horner and Jane his wife’ having ‘4 messuages and a shop in Wakefeild and Pontefracte’ in 1589. So I take Jane to be his wife and Elizabeth as an error in the booklet. Francis Horner, their son, is our next direct ancestor. We don’t know when he was born, 1573 at the earliest, but we know that he died in 1616 and was buried in the parish churchyard in Wakefield. We don’t know his wife’s name but we do know that he had a son called James Horner who married Jane Smithson at the parish church in Wakefield in the July of 1634. The dates of birth of James and Jane are not known, but they continue our branch of the family with the birth of James Horner in 1635 in Ardsley and baptised in April at Wakefield parish church. He married Mary Twigg at Ardsley Church in East Ardley, Wakefield on August the 9th 1663. 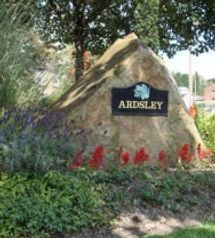 Ardsley is two miles from Wakefield. 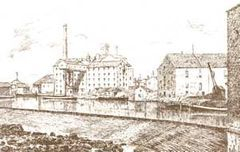 Their son, James, born in 1665, continues our line. We don’t know the name of his wife but with his only daughter, Ellen, born in 1692, it’s a fair assertion that his wife was called Ellen, too, and that they married in 1691. They had three sons. William was born in 1699, John in 1695, and James in 1694. All their children were baptised at Wood Church. It is their eldest son, James, who continues our line. James married Dorothy some time around 1721 with their son James born in 1722 and christened on September the 23rd at Wood Church. The IGI has this christening date, but with Samuel Horner as the father not James. I have found no leads from this one and must go with the Horner Family book’s James and Dorothy as the parents of our James here. However their other children listed in the H F book, are not born until the 1730s, with James given as the father. Something further to research here. Dorothy, it says, was buried at Wood Church in 1747, and her husband James the following year. But the H F of W book is clear about James being the son of James and Dorothy and it is he who continues our line. This was the year that Bonnie Prince Charlie and his Jacobite army marched from Scotland towards London but turned back at Derby. The Horner Family of Wakefield books relates that James and his neighbours hid and even buried valuables at the time. James was an active anti-Jacobite, as well as one of a congregation of independent dissenters who worshipped at Morley. Hannah Horner was their first born in 1745 at Ardsley and christened on the 18th of December at the Morley Congregational Church. Mary Horner is recorded as being christened on September the 1st, 1751 at the church above. She married George Craven. There is no christening date for Elizabeth but she married Jeremiah Stott of Wakefield in 1788 at Wakefield. James Horner was born in Ardsley in 1765 and married Mary Wood of Harewood. He died in 1814. He was to have started our line (see the beginning of this section) but instead he continues the line started by Thomas Horner. In 1777 he decided that Mary Blackburn of Tingley Moor was the woman for him, and the IGI records show that they were married on the 23rd of December at Saint Peter’s in Leeds. They must have been very much in love because they had a second wedding in 1778. More likely this one is an error in the HF of W book. Mary was born in 1757 and her father was William Blackburn. Tingley Moor was close to Wakefield. Notable Morleians include Prime Minister Asquith and cyclist Beryl Burton. Ernie Wise grew up in Ardsley. Joseph, living in Wakefield, had to walk six miles to worship at Morley Independent Chapel. Being a strict Sabbatarian he couldn’t ride. Consequently, he became an active promoter of Zion and Salem independent chapels. He eventually withdrew from Zion in order to concentrate on Salem and the building of a chapel in Wakefield. The H F of W book relates that it was said of him that “he had Christian faith enough to have walked on the water.” He took great interest in the working classes and gave a course of lectures on Bunyon’s Pilgrim’s Progress, which was unique for that time. His death on December 23rd 1814 was such that “every Christian felt he had lost a brother, and every poor man a friend.” He was buried at Salem Chapel. Mary died on the 25th of January 1815. Joseph and Mary had nine children between 1779 and 1794. Their middle child, James, is the one who continues our line but before meeting him, we should consider some of his siblings. John Horner 1779-1829 and Family. John was the eldest son, born on the 21st of January 1779 in Wakefield. He married Sarah Hall,also of Wakefield, on the 2nd of February 1804. 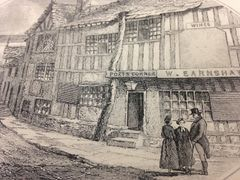 Sarah was born on August the 24th 1788 which means that, according to the H F of W book, she was only fifteen when she married John.T hey lived at Horner’s Place and their children were all born in Wakefield. Sarah was still only 26 at the birth of her seventh child. 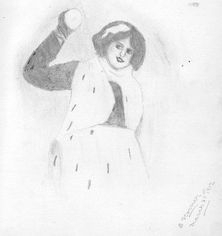 Eliza was John and Sarah Horner's first child, born on the 26th of February, 1805.She remained single and died on May the 16th,1857. Maria was born on the 30th of September 1806. She died, just after her twenty-first birthday, on December the 27th 1827. William was born on the 18th of October 1808. He married Frances Stead on the 12th of May 1833 at Rothwell,Yorkshire. They didn’t have any children. William died on January the 5th, 1860. Sophia Horner was born on May the 28th 1810. She married William Dawson Mortimer of Bradford about 1837. William was christened on the 6th of November 1814 in Tong,Yorkshire, the son of William and Elizabeth Mortimer. Sophia and William lived in Bradford, where William Alexander Mortimer was born in 1838, and Walter Hall Mortimer was born in 1846. Walter had been given his grandmother Sarah’s maiden name as his middle name, a common practice and helpful to genealogists! 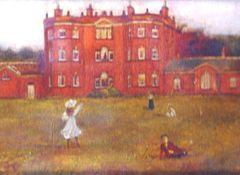 Walter became a wholesale tea dealer, and he and his wife Jemima lived at Ropley Lodge in Middlesex with their four children and four servants. Sophia and William moved to Lewisham in the 1860s where William died in 1872. Sophia passed away six years later. Emma Horner was born in 1811. She married John Fawcett of Wakefield on April the 1st 1832 in Wakefield. They had one daughter who became a farmer’s wife, marrying John Rogerson. Sarah became Joseph and Mary’s 6th child when she was born on the 13th of March 1813 in the Stanley area of Wakefield.. She married Joseph Sykes about 1836, and they had one child,Walter Sykes, born in 1837 and christened in the 30th of April in Swinton by Sheffield. Walter qualified as a doctor at Edinburgh University and went into practice in Batley. John Horner was the 7th and last child, born in 1815. Sadly he died aged eight in 1823. Joseph was Joseph and Mary's second child, born on the 30th of September 1780 and christened at the New Chapel Independent, Morley on the 26th of October. Taking both his father’s name and his christian vocation, he was one of the most energetic and liberal supporters of Salem Chapel. He was also active in political reform and was charitable to all people regardless of their creed or political party. Not surprisingly, he was a Libra starsign. He spared no expense in the education of his eight children and his wife’s nieces and nephews. 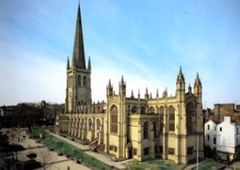 He married Elizabeth Jubb on the 20th of December 1809 at St Peter’s church in Leeds. Elizabeth was the daughter of John Jubb of Churwell who had two other daughters called Mary and Martha. Elizabeth was born on the 7th of April 1783 and baptised on the 16th of May at Morley Congregational. As an aries she would have had great dynamics with her husband and their life together would never have had a dull moment! Joseph was quite a local celebrity and used to relate amusing anecdotes of his earlier life. He was a very active opponent of Slavery, particularly that in the West Indies. He believed that christians should be active in politics and society at large as well as in their religion. Together with his sons John and Joseph, he was elected to Wakefield Town Council, having compaigned vigorously to have Wakefield granted its charter. Ann, known as Annie, was Joseph Horner and Mary Blackburn's third child. She died in infancy. Not sure of the exact year of her birth but after 1783 and before 1786. She married William Nicholson on the 9th of May,1811 in Wakefield. William was born in 1783 to Robert and Mary Nicholson. They emigrated to the USA, and I have no more information on them. The fifth child of Joseph and Mary. He was baptised at the New Zion Independent Church in Wakefield on the 23rd April. He was a corn merchant by trade, like other members of his family. 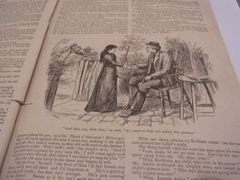 It is his marriage to Jane Race that begins the branch of the Horners which eventually connects to the Chaddock-Lowndes and then back to the Races. Jane was born in 1783 and baptised on the 16th of November at Sandal Magna, two miles south east of Wakefield and three miles east of Horbury. She was one of five children born to Joseph and Sarah Race of Horbury. More about them in the Race section. 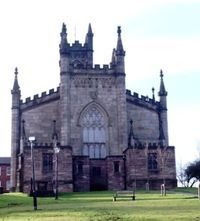 Jane eventually became a June bride when James married her on the 19th of June 1815, at St John’s Church in Wakefield. Already thirty-two, Jane wasted no time in starting a family with Joseph arriving the following year. With both their parents named Joseph, choosing a name wasn’t difficult. Thank goodness Jane gave Joseph Race as his middle name because records show that James Horner married a Jane Peace rather than Jane Race. It fooled me for a while. James named their next son after himself, giving him the middle name of Richard. This is a traditional Race christian name. In 1821, they had a daughter who,of course, was named Jane. They were all born and lived in the Wakefield area. So this union brought together the Races and the Horners in the family tree. Jane’s brother, Thomas was to ultimately bring together the Races and the Hunters, through his granddaughter Sarah. 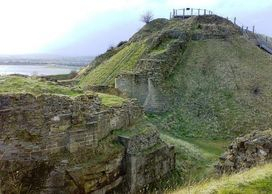 The remains of Sandal Castle overlooking Wakefield. William Horner was Joseph and Mary's sixth child, born on the 1st of January 1787 and christened at the Zion Independent Church in Wakefield. 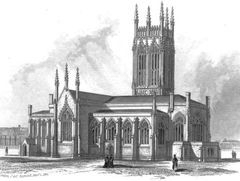 He married Mary Martha Blackwell on the 14th of December 1815 at St Martins in Lincoln. She was the daughter of William Blackwell, a local merchant. They had four children in all and lived in Wakefield. They eventually divorced, and Mary married Thomas Shearman in 1838 in Doncaster. By 1861, Mary was widowed. Interestingly, William was buried in 1839 at Bunhill Fields Cemetery in East London where William Blake, Daniel Defoe and John Bunyon were also laid to rest. Mary Martha died in 1865 and was buried in Eccleshall, Sheffield. Joseph Lamb Horner was their eldest child, born in 1816. He died in 1833, aged just seventeen. William Blackwell Horner was their 2nd child, born in 1818 in Wakefield. Initially he trained to be a Minister. He travelled extensively during his life. He was a newspaper editor in the United States, and a journalist and publisher at Paternoster Row, London. 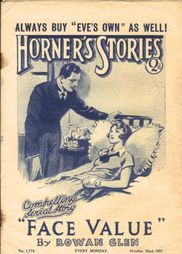 His "Horner's Penny Stories For The People" were a late Victorian phenomena. 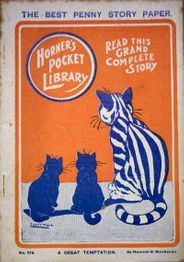 By 1889, 147 novels had been published, and novel number 1000 came out in 1912. The emphasis was on wholesale rather than sensational cheap fiction. He lived at 'Grassmead ', Reigate Road, Reigate. He married Frances Eadon of Sheffield in 1846 which was also the year that the Horner Brothers engineering partnership ended. Frances was born on March 6, 1817, the daughter of John and Sarah Eadon. and they had two sons, William Whitfield Horner and Milton Horner. They also had two daughters, Fanny Eadon Horner and Victoria. Milton and Victoria were born in the USA. The 1881 census tells us that Milton became a publisher of religous works like his father. 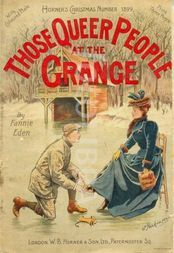 Fanny wrote many romantic novels under the pen name of Fannie Eden, published by her father's W.B.Horner and Son. She contributed greatly to the popularity and success of her father's Penny Stories. Her stories such as "When a maiden reigns" and "Sweet Molly Brierly" often surface on ebay and Amazon.com. Fanny died in Reigate on June 8th, 1945. You can see many of Fannie's stories on the left, and further down the page. Many thanks to David Robertson for this information. He kindly contacted me and made this section what it now is. He is writing a biography of Alec, who comes from a long line of Horners who made their mark in the world! Henry Horner was William and Mary's third child born on the 15th of May 1819. He had his own firm, Henry Horner and Son, Land Agents in Sheffield, as well as being in partnership with his brothers earlier. He married Anna Clift of Westbury,Wiltshire and they had three children: Richard Clift Horner, born in October 1846, Anna Clift Horner, born March 1848, and Hester Clift Horner, born May 5th 1852. His second wife was Jane Blackwell of Newcastle. Henry died in 1903. Frederick Horner was their 4th child, born in 1822. 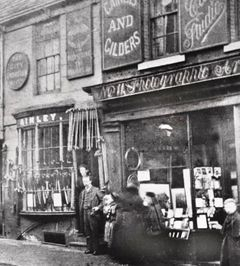 He was originally a schoolteacher before going into business with Henry and William as the Horner Brothers, working as engineers and merchants in Sheffield and Manchester. Their partnership ended in 1846. Frederick had no children. He died in 1878. Lucy was born on the 30th of September 1789 and christened on the 8th of November at the Zion Independant. She married John Pape, a merchant from Wakefield,on the 16th of April 1816 at Wakefield Parish Church. Lydia Horner 1794 Lydia was born on the 13th of February 1794 in Wakefield and christened on the 30th of March. She married Benjamin Waterer of Betchworth,Surrey. Jane was born on the 18th of April 1821 and christened on the 8th of January 1822 at Salem Chapel George Street-Independent,Wakefield. At the age of eighteen, she married Joseph Hirst, a Tin Plate Worker, on February 27th, 1840 at St Michael, Ashton Under Lyne, Lancashire. Joseph was from Ashton, born in 1818. He was the youngest son of John and Lucy Hirst. 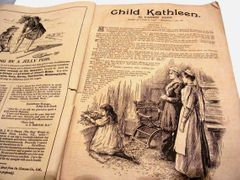 John was a shoemaker, and had another son, Thomas, born in 1816, as well as daughters, Sarah Ann, 1814; Mary, 1912; Betty, 1810; and Hannah born in 1808. John and Lucy were meticulous family planners! Joseph Horner Harold Hirst was Jane and Joseph's first child, born in the last quarter of 1840, and christened on January 22nd 1841 at St Michael. Lavinia was born four years later in Manchester. The 1851 census records a Joseph Hirst, aged forty, who is a Tin Plate Worker lodging in Bethnal Green. I could find no further records of Joseph. Lavinia is staying with her Uncle Thomas Horner in Cheetham, Lancashire, and Jane is a governess in Roundhay, Yorkshire. By the 1861 census, Jane and Lavinia are together again, helping out in the household of Jane's brother Joseph Race Horner in Hastings. With her experience as a governess and child nurse, Jane must have been invaluable. It is not known where Joseph Jr was during this time. The 1871 Census shows Jane visiting Lavinia at St Mary Newington, Lambeth, London, after her daughter's marriage to Thomas March in 1869. With two very young children, Lavinia and Thomas must have found Jane a great help at that time. Jane is never recorded as a widow but as married. So the mystery of her husband Joseph and his whereabouts continues. Similarly, their marital relationship. What became of Jane after 1971 is equally intriguing. A Jane Hirst, born about 1821, died in Camberwell in 1874. This is the area where she was living with Lavinia. However, the 1881 census, records a Jane Hirst, boarding at 3, Vaughan Parade, Tormoham, Devon, aged sixty and born in Wakefield. She is of independant means. She is still there in 1891 and 1901. I originally thought that the Camberwell death was more likely because I couldn't see why Jane would move so far from her family. However the Devon information gives her as born in Wakefield whereas the Camberwell death doesn't give the place of birth. Yet another mystery ... why did Jane not remain closer to her daughter and grandchildren? It's interesting that both Jane and Joseph's children married Londoners. I think that Joseph was from London originally, although I cannot confirm this. Perhaps Joseph junior went to school there whilst his mother and sister were living up north and then in Hastings. Also, the spelling of Jane's married name Hurst changed to Hirst soon after the birth of her son Joseph. His birth spelling is Hurst but the 1841 Census spelling is Hirst, as are his parents. We know he spent his early years in Ashton Under Lyne, and may have lost his father at an early age. It's not until the 1871 census that we meet him again. He has married Sophia Elizabeth Austin and they are living in Bermondsey with a child, Charles Race Hirst, born in March 1871. A descendant of Joseph's has the marriage dated for 1866. Sophia was born in Hoxton, London early in 1845, daughter of William and Sarah Austin. The 1881 census shows Joseph and Sarah living at 9, Parfitt Road, Rotherhithe with five children. Joseph is a solicitor's clerk. His great-grandson reminded me that Joseph's uncle, Joseph Race Horner, was a solicitor. Perhaps a family connection, though Joseph's uncle was in Cheshire at this time. By 1891, they had eight children: Charles,William, Lannie, Walter, Alfred, Cecilia, Clara, and Henry. Alfred married Sarah Eliza Brown in 1905, and they had four sons. It was Alfred's great-grand-daughter, Nicola, whose information helped me develop this part of the Horner Family Tree, and her father Richard who helped me complete it and correct errors I had made interpreting some of the Censuses. Joseph died in 1904 in Bermondsey, but it remains a mystery as to what became of him during the 1850s and 60s. His widow, Sophia, moved to West Ham with her eldest son Charles. She died in 1919. See details of her early life in Jane Horner's section. She married Thomas March circa 1868, and they set up home in Newington, London. Thomas was from Hackney, born on January 23rd, 1837, and the son of Thomas and Maria March. He was a leather seller by trade. Their first-born child was Thomas Harold, born in the second quarter of 1869, with Lavinia Jane born in October 1870. As previously mentioned, Jane Horner lived with them initially. The 1881 Census records them living at 96, Great Dover Street, Newington. They now have a third child, Charles Herbert Horner March (known as Bertie) born early in 1874, and young Thomas is now known as Harold. Thomas Harold married Marion Edith Harrison who was born in 1875, and their daughter Marion Elsie was born in 1899. They moved to Kingston, Surrey. Thomas and Lavinia moved to Bromley, and the 1911 Census shows their daughter Lavinia Jane is still with them. 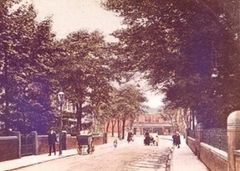 Bertie was married in Bromley in 1899 and moved to Barnet. He had a son, George Herbert, born in 1903. By 1871, the family were back in Lancashire living in Blackpool. The 1881 census is very interesting. Daughters Ann, Sarah, Mary and Clara are all teaching in a school in Albert Road, Birkdale with niece, Irene Procter one of the fifteen pupils. Their mother Sarah is living on the premises. Thomas, however, is living at 19, Queen Street, Layton with Warbreck, Lancs, with housekeeper Mary Goodier. The vicar of Hanslope’s wife and daughter are visitors. He is now a retired house factor. The 1891 census shows his wife Sarah, now 74, still living at the school with just one of her daughters, Sarah, teaching there. Sarah died later that year. There is no record of Thomas for this census. Anni was born in Cheetham, near Manchester in 1849 and christened at Manchester Cathedral on the 17th of January. She became a schoolteacher and worked with her three sisters at the Horners’ school in Birkdale. I believe that she remained single. 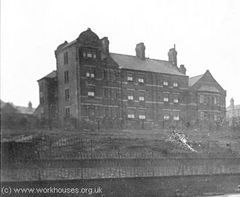 Sarah was born in Manchester in 1851 and worked at the Birkdale school with her sisters. She continued there after her sisters left. Mary was born in Manthorpe, Manchester in 1852 and also taught at the Birkdale school. She had left by 1891. There are a few Mary A Horners who married in Lancashire during that period. Nothing definite for our Mary. Clara was born in Burnage, Lancashire in 1855 and christened at Manchester Cathedral on the 21st of September. 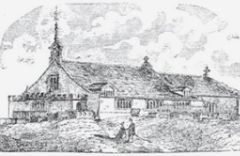 She was the youngest of the Horner teachers, but in 1882, she put down her chalk and married Edward Gordon Cockrell at St Paul’s Southport. Gordon Lawrence was born in 1883, Dorothea Grace in 1887, and Addison Noel in 1894. Gordon married Evelyn Wainright in 1918 in Salford. Noel married Elsie Kingswell Allen in 1924 in Southport. Their children were Michael and Angela. They lived in Wimbledon with Michael becoming a gardener at Hampton Court. Noel died in 1967, three years before his sister Dorothea. She took after her mother Clara Blanche and her aunts by becoming a teacher. She was Principal at Saxenholme Girls School in Birkdale. Joseph was James and Jane's eldest son, born on the 10th March 1816 in Wakefield. Unusually, he wasn’t baptised until the 28th February, 1817 at Salem Chapel George Street-Independent,Wakefield. His siblings, James and Jane had similar gaps between birth and christening. Both his grandfathers were called Joseph and he was given his mother Jane’s maiden name, Race, as his middle name which was just as well for genealogists! Joseph is one of my maternal great-great-grandfathers, along with William Chaddock. He moved to Manchester and worked as a solicitor. Living in Manchester, he got to know the novelist Thomas De Quincy, as well as Wordsworth, Coleridge and others. Despite being several decades younger than these digniteries, the young Joseph mixed freely in these circles. 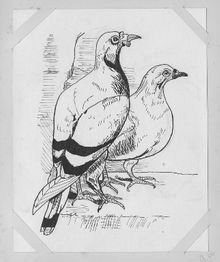 Joseph had an interest in sketching too. 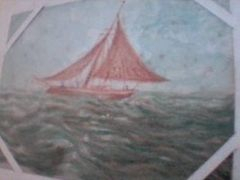 I have a watercolour of a boat (see opposite) painted by Joseph in 1887, the year after his brother James died. It’s in one of my Granny Ione’s albums. She knew him as Grandpa Horner. 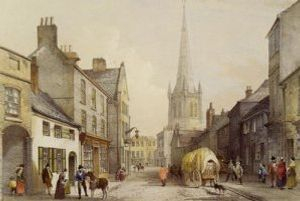 Joseph met Anne Potts of Hayfield, Derbyshire (above) and they were married at The Cathedral of Manchester on the 2nd October, 1848. Ann was born in 1830, the eldest child of Thomas Potts, a cotton spinner, and Mary Ernil. Thomas and Mary had married on the 26th of July 1829 in Glossop. 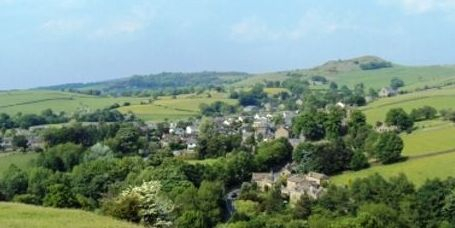 Hayfield is a picturesque village (see above) sometimes called the gateway to the Peak District. The actor,Arthur Lowe was also born there. 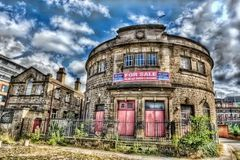 It is close to the town of Newmills. From Yorkshire to Lancashire to Derbyshire. Already,Joseph was on the move. 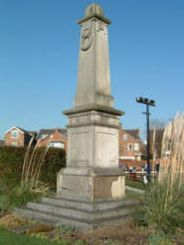 He and Anne started their family in Deansgate, Manchester with the birth of Annie Louisa in 1850, followed by Emilie Race in 1851. Annie and Emilie can be found in the Procter and Chaddock-Lowndes sections respectively. 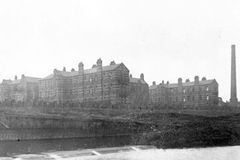 Joseph and Anne moved to Levenshulme in Lancashire where Joseph Arthur was born in 1854. 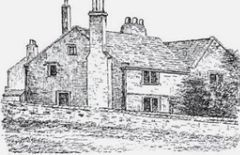 Joseph and Anne then moved to Bowden, Cheshire, where Edith Paulina was born in 1858. Her middle name was chosen by their daughter Emilie as the christian name for her second daughter in 1890. Sadly, Pauline Grace Chaddock-Lowndes died after three days. Joseph and Anne still had itchy feet, and they next moved on to Hastings by the sea where Horace Hastings Horner saw the light of day in 1864. We know they had been there for at least three years because of the 1861 census. Interestingly, Elizabeth Chaddock had also moved to Hastings at that time. Perhaps this is where the two families met and got to know each other,although they did come from neighbouring counties. Either way, Emilie met her future husband Thomas through this association. 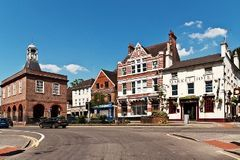 By the time their sixth and final child was born, Charles Eric Horner, in 1868, the family had moved to Head Street, Sale in Cheshire and on to Broomfield Wardle Road by the time of the 1881 census. Some interesting information is derived from this census. Joseph is still a solicitor, though his clients must have found it hard to keep track of his movements during the last few decades. 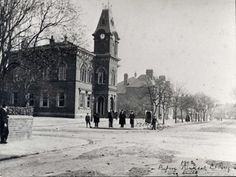 His son, Joseph Arthur,was also a solicitor—the son in Horner and Son. He was now aged twenty-seven and still living at home, as was Edith. They had a resident cook and a housemaid. Horace must have been away at school or college, and Annie had married. Emilie was also married and living in Hastings. Eventually she would take up residence at Ramsdell Hall and the Horners’ descendants would be frequent visitors, making entries in their cousins’ autograph and sketch books. The only reference to Clara is in the 1851 census. She is recorded as Joseph and Ann's daughter, less than one month old. With Emilie born during the second quadrant of 1851, this rules out their being twins. The census took place on March 31st, which explains and confirms Emilie's birth later. A real genealogical mystery which continues to puzzle me. See mainly in the Procters section. She was my mother’s great-aunt, and it was her daughter Irene who painted several pictures of Ramsdell Hall. See mainly in the Chaddock-Lowndes section. You’ll notice that Emilie was given her paternal grandmother’s maiden name as her middle name just as her father had. Names play such an important part in genealogical research. We would be lost without them! She was my mother’s maternal grandmother and a direct ancestor. Thank you to http://www.spinningtheweb.org.uk/ for the above photo and biography. 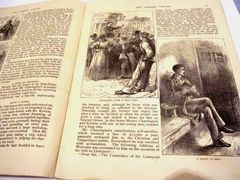 It comes from "Manchester and Salford at the Close of the 19th Century: Contemporary Biographies, page 173. held by the Manchester Library and Information Service. Thank you also to a descendant of Joseph, whose guest book entry here informed me about Joseph's first wife, causing me to re-write this section. During the process, as is so often the case, I uncovered new information about Joseph and his family. 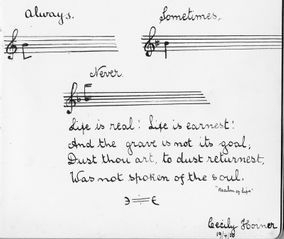 John Gerard Horner was born in Sale on October 19, 1885, and christened at St John the Divine on February 7, 1886. He, like the rest of the family, was a frequent visitor to Ramsdell Hall where he met Iris Chaddock-Lowndes (see her own section) They featured in the 1925 double wedding alongside Iris’ brother Roddie and John’s cousin Marjorie. Keeping it in the family, John became a solicitor. He died in 1939, and Iris died in 1942. Both were only in their early 50s. Their daughter, Asphodel, born in 1930, is still alive and playing an active part in her local community. Annie Cecily Horner was born in Sale on September 19, 1887. She was also known by her middle name, Cecily, as the poem below shows. Details of her mother or her maternal grandparents are not yet known to me, but I would expect there to be a Cecil or Cecily somewhere, given her brother's middle name too. Annie married Wilfred Taylor Corbishley in 1912 at St James Church, Macclesfield. Wilfred was born in Macclesfield on February 6, 1887. 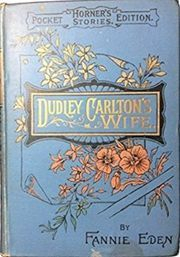 He was the youngest son of George Hamilton Corbishley, a silkman and agent born in 1841, and Ruth Taylor, born in 1842. Census records show that in 1911, Wilfred was staying or living with his older brother George and his family in the Okanagan area of British Columbia. Both George and his wife Elizabeth died in Penticton, and that is almost certainly the city they lived in at the time of the census too. Consequently, it is likely that Wilfred took Annie to live there too. 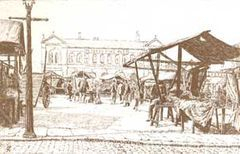 A George Corbishley was born in Macclesfield between 1912 and 1914. This may have been their son, named after Wilfred's father, and also his elder brother, but I have found no American records for him or other possible children. Wilfred died on August 18, 1949 in Victoria, BC, and Annie died on January 5, 1976, also in Victoria. I recall my mother Ina once telling me that a relative, who I now recall was Cecily, was very excited because Alexis Smith, a girl from their town had made it big in Hollywood. Alexis, though raised in Los Angeles, was born in Penticton, BC. Although Penticton is over a hundred miles from Victoria, it is part of the Okanagan Lake and Valley where Wilfred's brother lived. Further confirmation that Wilfred and Annie initially lived in the city of Penticton. In 1917, Annie's cousin Lionel Procter was married in Summerland, five miles from Penticton, though he and Edna moved to the States the following year. Perhaps Lionel had met Edna by way of his cousin. Returning now to Annie Cecily's parents. Sadly in 1888, Annie Horner died at the age of thirty-four, and Joseph Arthur found himself not only widowed, but with two very young children to bring up. His mother Anne stepped into the breach, as the 1891 Census showed, with the four of them living at 21 Washway Road, Sale. 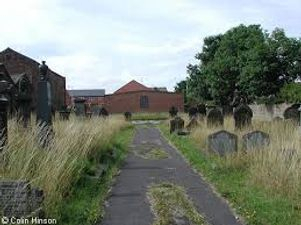 Anne was recorded as widowed, but in fact her husband Joseph Race was lodging with the Tiplady family in Birkenhead. Curiously, he was also recorded as being widowed. Joseph eventually met Ethel Cope. She was born in Alsager in 1866, and christened on October 28 at Church-Lawton. 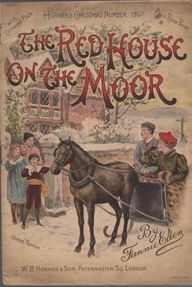 Ethel was the daughter of Charles Cope from Norton In The Moors, and Hannah Kent who came from Hanley. Charles, an engineer, had died in 1879, aged just forty-six. Joseph married Ethel on January 7th, 1892 at All Saints Church in Odd Rode. Charles was born the following year. As well as being a family of solicitors over the years, the Horners were also very creative! Charles was of the latter persuasion. 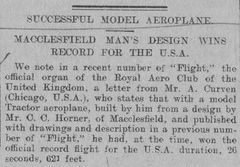 Following in the footsteps of his grandfather, Charles, and Uncle Charles, both engineers, he became an architect draughtsman, and he designed a Tractor aeroplane which A.Curven of Chicago,USA built, and which, at the time, won the official record flight for the USA, duration 26 seconds, 621 feet. This was published in "Flight" the official organ of the Royal Aero Club of the UK. 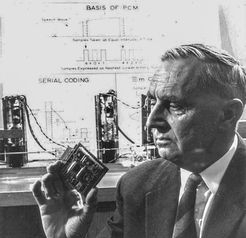 It would be interesting to know more of Charles’ work. During World War One, he was a member of the 7th Battalion, Cheshire Regiment, 8th Manchester Regiment. He married Marjorie Goodwin in 1916 in Macclesfield. Marjorie was born in 1894, daughter of Harry and Annie Goodwin. Their first child was born in 1917, and they named him Joseph, after Charles' father. Sheila Marjorie was born circa 1919. Charles died in 1982 at the age of eighty-nine, and Marjorie in 1979. At Ancestry.co.uk, it says "This photo is hidden by the owner's request." I am the actual owner of these 'photos' and I do wish anyone to view them!! 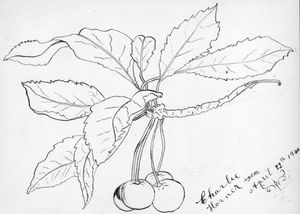 Beryl Horner was born in the last quarter of 1898, and christened on October 2nd in Rainow-with-Saltersford (pictured below) On the left are two drawings by Beryl on March 31st, 1912. Otherwise, I have been unable to find any trace of Beryl. Joseph and Ethel were now living at Marsh House in Rainow, Cheshire. In due course, they moved to 37, Balkeslow, Macclesfield where the 1911 census found them with their four children still with them. Ethel may have worked at Rode Hospital during World War One along with her nieces, Ione and Iris Chaddock-Lowndes. An Ethel appears twice in Ione's photo album but it may be a different Ethel. She and Joseph's family are certainly well represented in another of Ione's albums as we can see above. Ethel died in 1927. A Joseph Arthur Horner died in Lancashire in 1933. I think he was our Joseph. 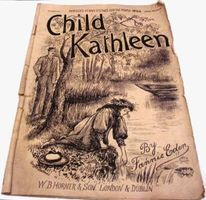 Edith was born in Bowden, Cheshire in 1858. She married thirty-year-old Thomas Whitwell Jacques of Bedminster in Gloucestershire, on the 23rd August 1883 at Manchester Cathedral. Frederick Douglas Ashton Jacques was born in 1885, and Frances Dorothy Edith Jacques was born three years later. Marjorie Violet Emma Jacques was born in 1895. They lived in Mangotsfield, Gloucestershire. Edith's sister Emilie named a daughter Paulina. No records of Edith or Thomas in the 1901 or 1911 censuses. The wonderfully named Horace Hastings Horner was, of course, born in Hastings, in 1864 and then baptised at Manchester Cathedral in 1868. Sadly, he died of influenza at Waukaringa, South Australia on August the 19th, 1891, aged only twenty-seven. 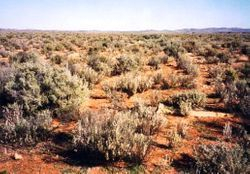 The area was initially settled in 1873 with the discovery of gold. Waukaringa is now a ghost town after being abandoned in the 1950s. There are cemeteries there, and Horace may be at one of them. Bless you Horace. He was born in Sale, Cheshire during the 3rd quadrant of 1868 and christened on July 6, 1870 at Manchester Cathedral. He attended Conway College in Wales, but after that, nothing is known for certain about him. I haven't been able to find him in the three censuses since 1881. James was the second child of James Horner and Jane Race. He was a year younger than his brother Joseph Race Horner but started his family five years earlier. 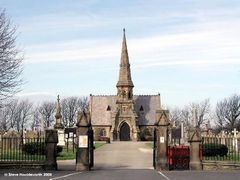 He married Mary Bullman Bernard in 1843 at St Mary’s, Oldham which is close to Ashton Under Lyme where they settled and raised their five children. Mary Bernard was born in 1821 in Oldham, daughter of George Bernard. 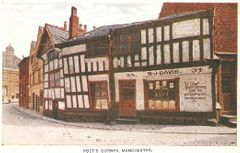 James was a merchant and dealer and lived first at Taunton Lodge in Knott Lanes and then in Gas Street. He was a man of some means because the 1881 census describes him as a Gentleman. He and Mary suffered two great losses as parents. Their fourth child Emma Jane, born on January 26th 1850, died the following year. Their fifth child Margaret Ann was born on July 6th 1853 but died in 1860 before her seventh birthday. The loss of Mary in 1886 must have hit James hard because he died a few months after. Their eldest daughter, Mary, was still living with them at the time and the loss of both her parents in so short a time must have hit her even harder. ( see below) James and Mary Horner had five children, but only their two sons went on to become parents themselves. Mary was James and Mary's eldest child born in 1845, and christened on April 6 at St Michaels, Ashton Under Lyme. With her two younger sisters dying in their infancy, Mary was the only daughter to reach adulthood. She remained with her parents until their passing in 1886 (see above) She never married but moved to Macclesfield to live with her Aunt and Uncle, Anne and Thomas Lockitt. She died in 1905 aged 60. Bless you Mary. George was James and Mary’s eldest son, given his mother’s maiden name as his middle one. He followed in the footsteps of his uncle Joseph, becoming a solicitor. As a libra, what better profession for him to take up! 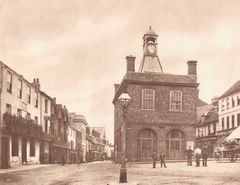 He left home and moved to Market Drayton where he lodged with Elizabeth Wilkinson at Shropshire Street. Having qualified as a solicitor, it was time to consider marriage and family matters. This took him to Bettws in Denbighshire, Wales where he met Jane Jones, aged twenty-four, sometime around 1874. They had a daughter early in 1875 who they also named Jane, and who was born in Denbighshire. So it looks like George lived for a short time in Wales. 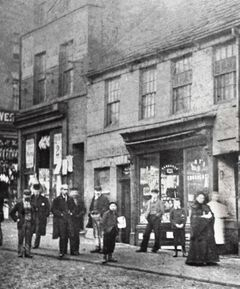 The next port of call was 47 Stafford St, Liverpool where we find the family for the 1881 census with George established as a solicitor in practice. George, like uncle Joseph, liked to move around. No records of George after this, or of subsequent children, but the 1891 Census of Wales records his daughter, Jane, in Flintshire. George died in Liverpool in the last quarter of 1898. What became of his marital circumstances after 1881 remain unclear. Born on the 20th April 1848, James took a different vocational path to his brother George, going into the timber business. Taureans tend to be good with their hands and have a bond with nature. Like his sister, Mary, he stayed longer with his parental family, but eventually he moved out. The 1881 census finds him living in 286, Wellington Rd, Stockport with Eliza Derbyshire as his housekeeper. Not for long, however, because he married Luna Proctor early in 1885 at Prestwich Registry Office. His cousin, Annie Horner also married a Procter, James. So Annie Horner becomes Annie Procter, and Luna Procter becomes Luna Horner. As far as I know the Procters were unrelated. Also, James’ branch ended in ‘er’, and Luna’s ended in ‘or’. Luna was born in 1866 in Doncaster, one of six children. She was a domestic servant in the Fletchers household in Stockport at the time of the 1881 census. She and James stayed in Stockport to raise their children, Luna, Bernard, May and Marjorie. James died in 1924, and Luna in 1937. James was remembered in Wisden's cricket obituaries for 1924: "HORNER, MR. JAMES, born at Ashton-under-Lyne on April 20, 1848, died at Stockport on July 18, aged 76. He was for thirty years Honorary Secretary of the Stockport C.C. For some years, too, he was Hon. 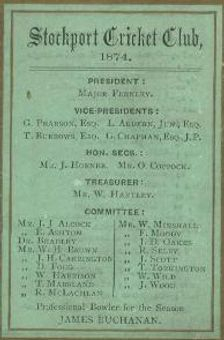 Treasurer of the Lancashire County C.C. and at the time of his death was a Vice-President of the Club." In fact, James served even longer, as this entry at Stockport CC relates: "One of the great local names with Stockport Cricket Club around this time was the late James Horner, a JP who was honorary secretary for 52 years, being also an honorary treasurer for Lancashire for 10 years. Mr Horner played against the Australians and was not out on four occasions." One of the matches in question took place at Stockport Cricket Ground, August 26-28, 1880 with James batting at number 18!! Australia fielded the usual eleven players but allowed Stockport to play eighteen ... presumably only eleven when fielding. James was 0 not out in the first innings and scored 2 not out in the second. 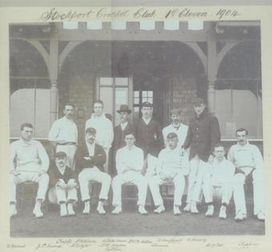 Stockport won the match, having lost the fixture in 1878. Stockport did field three Test players from Yorkshire who all contributed significantly to the victory. But in four attempts, no Aussie bowler could take James' wicket! James' great-grandson has a portrait of James from 1878, painted in oils by Davenport Bates, which was commissioned by Stockport CC. Grateful thanks to the excellent www.stockportcc.co.uk/ for the images below. Luna saw the light of day in Stockport in 1887, and despite erroneous references to her as Lima and Laura in various censuses (both fine names) she is indeed Luna, as in the moon, like her mother. She went to a boarding school in Birkdale, run by her aunts Sarah and Mary Horner, which her cousin Irene Procter also attended a few years before. 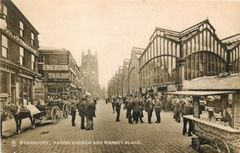 In 1920, she married Thomas Edward Forster at St Thomas Church in Stockport. One of her children is a good example of how our names are often steeped in family tradition. Edward Bernard Forster, born in 1927, takes Edward from his father’s middle name and Bernard comes from Luna’s brother as well as being the maiden name of her paternal grandmother. Edward’s elder sister, Mary Bernard Forster, is even better. She has her great-grandmother’s christian and maiden name in hers. Mary married Alastair Hector Mackay in 1949 at St Michael and All Saints Church in Bramhall, Stockport and moved to a farm in Oxfordshire where Mary's Aunt Marjorie lived out her last few years (see later here) Their son, Andy has contributed to this website. Bernard Horner was James and Luna’s only son, born in January, 1891. His christian name was his grandmother’s maiden name. Like his father, Bernard played for Stockport Cricket Club. He also played for Cheshire Gentlemen, Old Rossallions, and Manchester. He lived at 164, Shaw Heath, Stockport. During World War One, he was a second lieutenant in the Lancashire Fusiliers. He died on March 5th, 1917 aged just twenty-six. He is remembered in Wisden's Obituaries just as his father was. 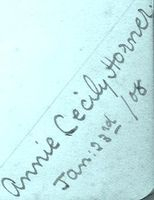 Her signature below (in her cousin Ione Chaddock-Lowndes album) tells us that she visited Ramsdell Hall in October 1907. She married Robert Humphry in the Spring of 1919 at Stockport. No further details known, including no children found, but a May Humphry died in London in 1933. 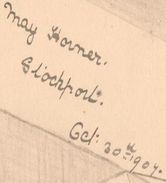 Marjorie Horner was James and Luna’s youngest child, born in the summer of 1900. Like her siblings, she often visited Ramsdell Hall where she features in some of the photos I have. She grew close to Roddie who was the youngest of the Chaddock-Lowndes, and they married in June of 1925 at St Mary’s Church, Stockport. This is one of the special moments in the Family History because St Mary’s witnessed two June brides that day. Roddie’s sister, Iris, also married a Horner in a double wedding. John Horner being a cousin of Marjorie’s and another of the family’s solicitors. Marjorie had only one child, Isabel Luna Chaddock-Lowndes who was handicapped. She was born in Cheadle on the 2nd of November, 1926, the same year as my mother, Ina. Isabel lived until she was sixty-seven and died in Bullingdon, Oxfordshire. 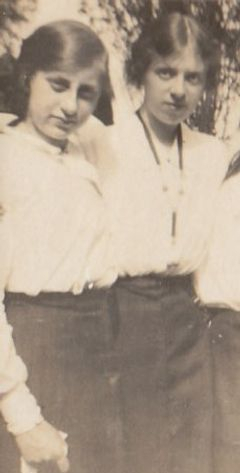 Marjorie was also known as Aunt Tiggy and after Roddie's death, she lived on an Oxfordshire farm - close to her daughter - with her niece Mary Bernard Mackay until her death in 1978.